In 2008, a marketing board was set up to promote the many designers of Maori descent working in fashion. Knitting together the Maori word miro (the weaving of fibres) with the Italian word moda (fashion), the newly-minted term Miromoda became the masthead for the board. It set out to encourage and promote and has enabled many designers with commercially viable output to come to widespread notice. This year, Miromoda will have its third show at New Zealand Fashion Week. One of the designers to show is Adrienne Whitewood. 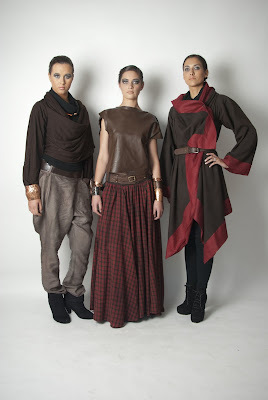 This photo, courtesy of Miromoda, shows three of her garments as a capsule collection which Whitewood calls Te Aho Tapu: the Sacred Thread. These are strong works, and a sympathetic eye may well see a modern interpretation here of the photographic portraits taken of Maori in the 1850s and 1860s. These are the decades where traditional Maori garments meet European pattern making and materials. There is the use of tartan cloth – tons of this arrived in ports in these years for the use of clothing shops and dressmakers. There is leather – in Whitewood’s work this is the soft, silky leather of lambskin rather than the tough bullock hide used for raincoats and ammunition belts of the period. And there are bold echoes of the swift Maori adoption of woven materials like wool, cotton and linen into their spirit of folding, wrapping and cloaking where coloured borders stand out with drama. In Whitewood’s collection, this delight in bordering is strikingly apparent in the black cloak where the cerise borders are done in rough, raw silk. For New Zealand Fashion Week, Whitewood will show a collection of six looks. Such an occasion is, of course, the result of a journey and along this path has been the support and interest of Miromoda. The garment is the red Fencing Jacket.